Provide comfort for the family of Virginia Termin with a meaningful gesture of sympathy. Virginia Marie Termin passed away ,Wednesday, April 10, 2019 in Cleburne. She was a homemaker. Virginia was born January 16, 1930 in Greenville County Ohio, to Frank and Emma (Link) Wright. Virginia began her young life at Hillcrest Guest Ranch in Morrison Colorado as a trail guide for hunting trips up into the Rocky Mountains. This where she met and married Raymond Termin in January 1955. They had five children and lived on ranches and farms for many years. Virginia enjoyed hunting, fishing and camping and thought the closest thing to heaven was the mountains. 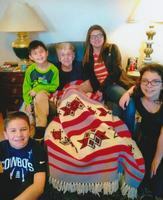 Through the years she created special memories with her grandkids and great grandkids. And she kept her husband Raymond’s promise of taking care of his “Pumpkin” (Valerie) until the time was right for God to take his angel home. Virginia is survived by sons, Roy Termin and wife Rebecca, Roger Termin and wife Wanda and Gene Ray Termin and wife Sarah; daughter, Linda Termin ; grandchildren Valenie Mancinas and husband Abel, Brandy Calhoon and husband Bryce and Steven Termin; great grandchildren, Alicia Romero, Gabriel Mancinas, Donavan Mancinas, Andrew Rockwell, Alexander Rockwell, and Jamie Calhoon; sisters, Viola McLeod. She is preceded in death by her husband, son Larry Termin and brother Robert Termin. To send flowers in memory of Virginia Marie Termin, please visit our Heartfelt Sympathies Store. Provide comfort for the family of Virginia Marie Termin by sending flowers. My condolences to the Termin family during this difficult time. In the Bible, Jehovah God gives us hope. Acts 24:15 says, “there is going to be a resurrection of both the righteous and the unrighteous.” Revelation 21:4 says, “and he will wipe out every tear from their eyes and death will be no more.” Very soon we will see the fulfillment of these promises here on Earth. We hope you find comfort in God’s promises.